We have 9 Alani propagated from the 2002 harvest.They are ready for outplanting. We are at 1500 ft elevation, and we can plant some here at the Garden (maybe 3). There is a couple in Kohala who have a beautiful restoration project–Will and Judy Hancock–over 10 acres of closed canopy koaia and other rare and interesting plants. Their elevation and rainfall would be just right, I think. My only reservation is I’m not sure about the long-term prospects for their site–I just don’t know about what sort of dedications they may have made for their land. Another possible site would be Waimea Nature Park in Waimea, where they would be well cared for and appreciated, but the rainfall might be a bit much. There seem to be a lot of pests on the plants in the nursery–at times, they have been attacked by red spider, slugs, white fly, mealy bugs, and scale insects. 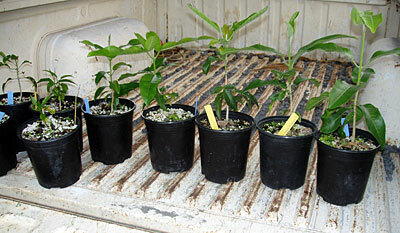 Here’s a picture that shows the range of vigor of the 9 plants–a few really robust, 4 of them sort of puny. Peter Van Dyke, of the Amy Greenwell Botanical Garden has reported successful propagation of Alani seed from the ’02 harvest. Sprouted in 2003 and successfully nurtured, they are ready for out-planting.